It seems pretty obvious that when a governing body, be it a local school board or Congress, elects new members, it does not simply “start over” with a whole new set of laws and regulations. New members become part of the corporate body and accept all that has gone before as the rule of law. That’s why they take the oath of office. As much as they feel they have a mandate for change, they cannot just disregard all the laws of previous Congresses. 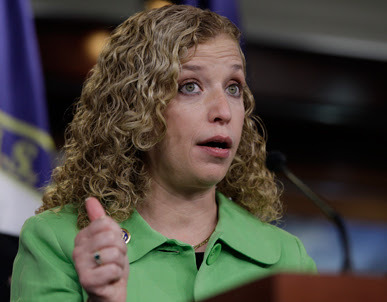 Enter Debbie Wasserman Schultz, a member of the U S House of Representatives since 2005, and an elected official in Florida since 1993. And the current chairman of the Democratic National Committee. …and she doesn’t acknowledge the law of the land. Do they really believe this “undocumented” rhetoric? Or are they just hoping we buy it? Does she not understand that her statement defies the United States Code, which she swore to uphold? It clearly calls for removal of anyone found in the United States without a legal right to be here. There are all sorts of loopholes for which immigration lawyers praise God every day, but the bedrock understanding of the law is that someone here without papers (aka EWI) is to be packed up and shipped back to their own country.